Lately I’ve been thinking about ways to get my young martial arts students to take more responsibility for themselves, for each other, for their training and their own progress. Of course I talk to them about these things, instruct them about doing so, urge them during class to be that kind of student. But words don’t always sink in; you just can’t assume they will get it. And this is doubly so with the younger kids. There are always a few who seem born with the right attitude. They focus, they work hard; they practice with the intent to make progress. These students are gems in the dojo; they would probably excel in any setting. Probably, too, their parents are reinforcing this ethos at home. Then there are the students who attend class with enthusiasm, but when the hour ends, they drop it like a toy left in the middle of the floor and move on to the next activity. Come the next class, they don’t remember what they practiced. It’s as if they have to learn everything anew, every class. Some of these kids will happily tread water forever, if someone doesn’t come along to push or pull them toward their next rank. Yet they want that rank. They just don’t understand they have to earn it; they don’t get it that they aren’t earning it simply by showing up for class. Practice with the intent to make progress. That’s what every student must learn to do, and what quite a few kids in my crowded younger-age classes have seemingly not been doing lately. So I did some thinking and decided, among other things, it was time once again to implement some form of Attendance Card/Test Card system to get them focused on what they need to do. I spent time on the recent holiday designing a new card to my liking, and more time over the weekend printing and cutting a set of color-coded, rank-specific cards. I’ll begin phasing in the new system today. Mind you, I have used various forms of “test cards” and “rank checklists” over the years. These new cards combine familiar old components. But I’ve made an important mental shift. In the past, no matter how I might have described it, I was treating them as tools to help me keep track of all the kids, their attendance, and their progress toward rank. I was bearing full responsibility for tracking the students, then providing the necessary motivation as needed. The tools were helpful at times, but when I found they were more trouble than help, I dropped them, picking them up again only when I had a suitable (or troublesome) group in class. This time around I realize the tools are for the students’ benefit, not mine. They are a visual representation of attendance and progress that can – and hopefully, will – begin to show even the youngest kids a connection between their own efforts and their progress toward rank. They’ll begin each class now, by getting & looking at their card, before bringing it to the instructor for use during class. It’s just one more component in an ongoing emphasis on taking responsibility for oneself. I want to credit Kelly Muir’s attendance-card system, as described in her book Instructor Revolution, for sparking this mental shift for me. (Her student-run dojo is all about taking responsibility!) My review of her book can be found here. Instructors: What tools do you use to help kids learn to take responsibility for their training? Please post your thoughts and methods in the comments section. Here’s a fictitious sample attendance card. The name and dates are made up, of course. A few things to note: The number of boxes in the attendance grid increases as rank increases (the first few levels have only 24 boxes). The number is higher than the minimum requirement for the rank. However, I’m not highlighting the minimum requirement, because it’s not important. Don’t focus on the minimum; rather, meet the minimum and keep training! On back, two levels of rank requirements are listed, and can be signed off by the instructor if desired. Check Your Holiday Gift Guide! We’re pleased to see The Kids Karate Workbook is now listed in the Century Martial Arts Catalog. It appears in their Holiday Gift Guide, too! As holiday season rushes toward us, keep in mind that a book makes a great gift on many levels. The Kids Karate Workbook helps kids love training (even more than they already do), promotes reading, and brings parents and kids together to discuss important topics like self defense (besides bringing them together to practice martial arts, which is a great family pursuit). Click here for Century’s online catalog. Or click here to order from Amazon. If you haven’t already found our facebook page and become a fan, you might want to have a look. We sometimes post interesting links and discussions that don’t appear here on this blog. Also, if you’re a fan on facebook, you can post links, make comments, ask questions, and start discussions on the topics that interest you. Go check it out! You can get there by clicking on the Facebook “badge” in the right-hand column of this blog, or by following this link to The Kids Karate Workbook Facebook Page. The Karate Cafe podcast recently featured the Kids’ Karate Workbook and author Didi Goodman, in an hour-long interview about the book, how it came to be, and various topics related to teaching and training in martial arts. Karate Cafe was founded five years ago to broadcast the kind of after-workout discussions martial arts enthusiasts love to have — talking about anything and everything martial arts, and continuing the conversation till all hours through an on-line forum. For the recent podcast, Episode #66, co-hosts Gene Myers of Auburn, NY, and Paul Wilson of Dallas, TX, had read the book carefully, and both had plenty of good things to say about it. One thing both hosts remarked on is how the book is not style-specific, but succeeds in spanning many different kicking/punching arts, from taekwondo to various styles of karate. Gene is a yondan (fourth degree black belt) and instructor in Chibana-ha Shorin-ryu karate, and also studies Two-Circle Jujitsu and Hakutsuru (White Crane) Kenpo. Paul holds a yondan in Shoryin-ryu Kenshin Kan, and is founder and head instructor of White Rock Kenshin Kan. Paul has also studied Tai Chi, Wing Chun, Aikido, Jiu-Jutsu, and Escrima. Gene noted that, in addition to being a great book for students and parents, The Kids Karate Workbook is also a useful guide for instructors who teach kids. He himself had used it to find new ways to explain things, and come up with new activities and training ideas. Both Gene and Paul remarked on the book’s straightforward style of explanation–clear enough for kids (without talking down to them), but also very readable for adults. They also praised the quality and clarity of Linda Nikaya’s illustrations (over 200 of them!) for conveying the techniques explained in the text. To hear the full interview, visit http://www.karatecafe.com/ — click on ‘podcast’ and listen to Episode 66. And while you’re there, check out all the other good stuff on the Karate Cafe site! Check out the Karate Cafe Podcast! The Karate Cafe crew – Gene Myers of Auburn, NY; Paul Wilson of Dallas, TX; and Dan Williams of Lansing, MI – host regular online discussions of all things martial arts, and invites the public to join in. Check out their archives at the Karate Cafe website, and you’ll find friendly, wide-ranging conversations among true martial arts devotees – the kind of people (like us) who leave the dojo wanting to keep thinking, talking and trying things out till late into the night. You are invited to join in the live podcast by phone, text or email this Sunday. Follow this link for details on getting connected. If you miss the live event, you can still tune in by visiting the Karate Cafe archives. Let this be the best year yet for your training. May you build strength, stamina, discipline and focus. May you feel the joy of good health and physical expression. May you have more fun than ever, pursuing an art that provides such serious benefits in your life. Have some serious fun. Let’s celebrate in pictures. Send me a great picture (or two) showing kids in action, training in martial arts. Include appropriate credits (your school and instructor, and the photographer’s name). We’ll add it to the photo gallery here on this site. Pass the word to anyone you know who teaches martial arts to kids– or who has kids who train in martial arts. A few folks have already responded– I have some pictures from Germany as well as the U.S. Let’s get as many schools, styles, states, and countries on here as we can! Send your photos to photos@kidskaratebook.com. I look forward to seeing and posting them! You’re invited to view mommaratzi’s photo gallery from last Sunday’s demo/party/book-signing at Redwood Dojo. There are some great shots from the demos– kids of all ages, as well as teens and adults. Click here. 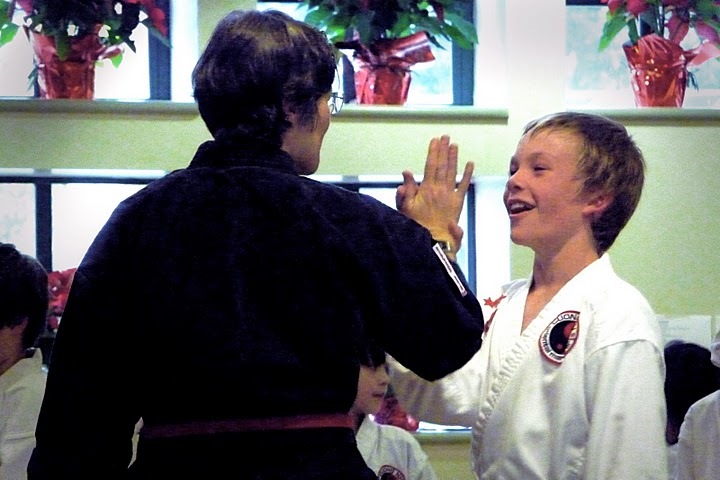 Do you have a fantastic photo of kids doing martial arts? Would you like to share it on this site? Let us know! Leave a comment below, or email didi@kidskaratebook.com. Should assistant instructors be paid? Can my black belt help get me into college? 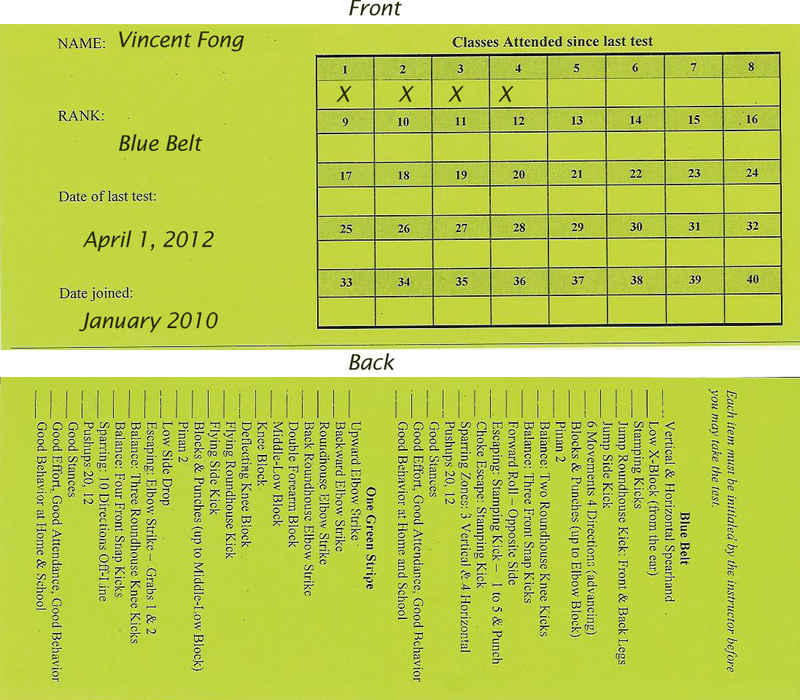 Belt Tests/Gradings – What’s the Best Way?